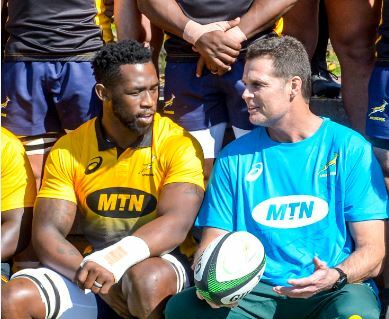 Siya Kolisi and Rassie Erasmus share a moment. Photo: Gallo Images. However, the positive responses by other social media users ‘displayed a desire to overcome the negative power of race and racism’. Reacting to racial rants on social media after the announcement of Siya Kolisi as the first black Springbok captain, Michael Morris, South African Institute of Race Relations’ (IRR) head of media, said race would continue to be a key feature of divisions because of South Africa’s past. “Racism will probably always lurk in every society; and it is all too easily inflamed by politicians and others who exploit race for their own selfish ends,” he said. However, Morris also said viewing Kolisi’s achievement through a racial prism risked overlooking, or worse, diluting his hard-won regard in the game, and undermined his status as a role model for all South Africans. “We would hope that his appointment is viewed as an achievement in its own right, a symbol of South African grit, ambition and possibility,” said Morris. Applauding him on his achievement, Morris highlighted the accomplishment to be meaningful, particularly to those who struggled to attain high standards and accolades in their chosen field. Morris also noted the positive responses by other social media users and said it displayed a desire for most people to overcome the negative power of race and the racism that rose from it. “We don’t believe that all South Africans relate everything to race or racism. We think South Africans should celebrate Kolisi’s elevation on his merits. “This should be celebrated as a reflection of his considerable achievements and skill as a rugby player. “We have no hesitation in believing he will strive to do his best, as his performance on the field so far attests,” said Morris.